How to Get Forklift Certification, Get A Forklift License In 1 Hour! Certify Your Employees to Operate a Forklift Today! Are you a manager, supervisor or foreman who needs to get your operators forklift certified? 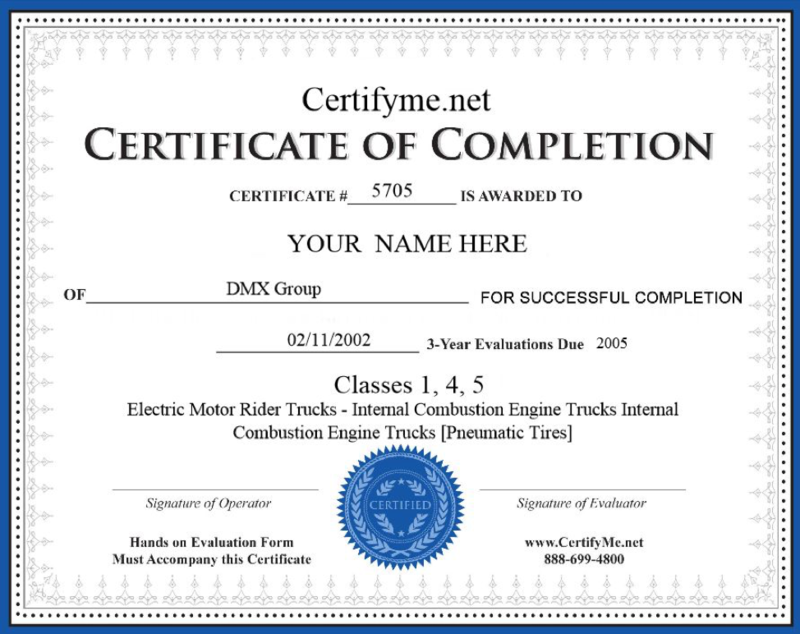 You can have them certified in 1 HOUR with CertifyMe’s online Forklift Training and Certification Program. This program is 100% OSHA-compliant. It provides all the training your employees need to safely operate up to 7 classes of powered industrial trucks per OSHA standards. On completion, you (or your employees) can instantly print their forklift licenses and operator cards. Hard copies, including laminated wallet cards, arrive by mail in about a week. And that’s it! If you’re not sure how to get forklift certified, start right here at CertifyMe.net! OSHA regulations require two phases of training to become forklift certified: classroom-style training and a hands-on evaluation. The classroom-style training is 100% online (and still OSHA-compliant). This gives your workers the convenience of learning and passing the test from their phones, a tablet or computer. And it saves your company money because there’s no travel and no time away from work. Once the training is complete, a hands-on skills evaluation takes place. And after a successful evaluation you can print the certification cards immediately – no waiting around for cards to arrive in the mail. From any internet-connected device, your employees simply take the forklift training program followed by a short test – each online. They WILL pass because they can correct any wrong answers during the test. This portion takes about one hour. After the test, there’s a printable operator checklist and evaluation form to conduct the evaluation. In other words, no special certification is required to conduct the evaluation. Any qualified employee can do it. With the CertifyMe Online Forklift Training and Certification Program, your operators can easily and affordably get certified in an afternoon. CertifyMe offers 3 forklift training programs, one for each of the 3 types of forklifts. Simply choose the program that’s right for each of your operators. These separate training programs are designed to save your employees time and save your company money. OSHA’s purpose is to keep employees safe. To carry out that purpose, OSHA keeps a close eye on employers to be sure they follow its safety regulations. Violations can vary from $3,000 to $30,000 per unlicensed forklift operator. Forklift certification is all about safety – and there’s nothing more important than the safety & well-being of your workers! If you want to know how to get forklift certified, you’re in the right place! CertifyMe.net has the training courses you need to keep your employees safe, and also avoid crippling OSHA fines and penalties! CertifyMe.net shows you how to get a forklift license. Simply sign up and register today and get started. Our program is affordable, convenient, and easy to follow! Those are just a few reasons why companies trust CertifyMe.net – we’ll show you how to get forklift certified! Available for 3 types (and 7 classes) of forklifts. Save money by using only what you need. One of the most common questions we receive is, how to get my forklift license? 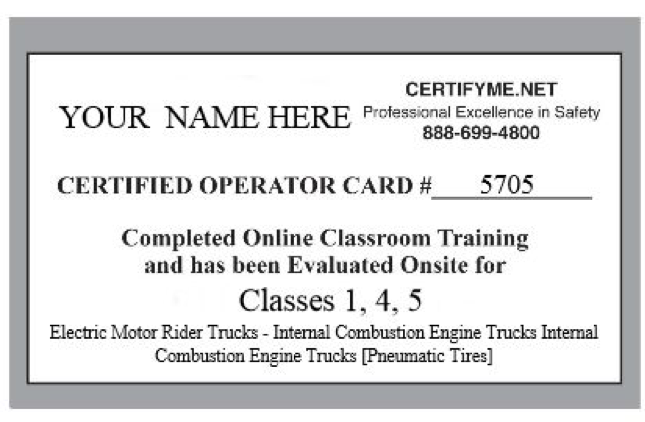 The answer is simple: CertifyMe.net, the leader in online forklift training and certification. Click here to review our courses and pricing. To speak with our OSHA safety experts about how to get forklift certified, please call 1-888-699-4800. We look forward to helping with your forklift certification today!